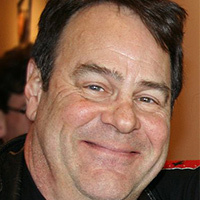 Which picture to use of the unforgettable Dan Ackroyd – him as a Conehead? A Belushi Brother? A Ghostbuster? Ackroyd, a Canadian-American actor born in Ottawa, Canada, has so many comedic personalities that it’s impossible to pinpoint for which one he is most beloved. Often the straight man in any comedic duo, Ackroyd can be deadly serious: Grandson of a Royal Canadian Mounted Police officer, he studied criminology and sociology during college and still rides shotgun with the Ontario Provincial Police. He also holds an advisory commission with the police department in Payne City, Georgia. Perhaps that explains his love for the role of Jack Webb in the modern-day update of Dragnet. Here are some little known facts about Ackroyd: He was born with complete heterochromia (one eye is blue, one eye is green) and syndactylism, a condition in which there is partial or total webbing of two or more fingers or toes; he was diagnosed with Tourette’s syndrome and Asperger’s syndrome; he is a big fan of paleontology; and he supports MUFON, a UFO study group. “The entertainment business is not the be-all and end-all for me,” he has said. Wife Donna and his three daughters must be very glad of that. Many say The Police sound the way they do not because of Sting’s melodies but because of Copeland’s aggressive yet subtle drumming style. His unique sound is derived from days spent listening to rhythmic tunes in the Middle East as a youngster when his father was a British diplomat. Casual fans might not know that, beyond The Police, Copeland has also been involved in music projects with bands and performers such as Gizmo, Oysterhead, Peter Gabriel, Tom Waits and even Snoop Lion. In addition, the nimble-fingered drummer has done scoring work for movies including Wall Street, Highlander 2 and Babylon 5. 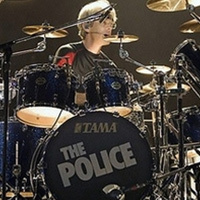 During his days with The Police, he became a videophile and shot constant Super 8 video footage of the band’s activities. That footage turned into Everybody Stares, a classic documentary about the band. Most people recall David Hasselhoff from one of two popular television series during the 1980s and ‘90s: Knight Rider and Baywatch. But the American actor, born in Baltimore, Maryland, actually began his acting career in the ’70s as a soap opera actor on The Young and the Restless, portraying Dr. Snapper Foster. Of German descent, Hasselhoff parlayed his Knight Rider fame into a successful European singing career. In 1989 – just before his Baywatch days – he released a single that remained number one on the German record charts for an astounding eight weeks. “Looking for Freedom” was that nation’s soundtrack to the Berlin Wall tumbling down. Hasselhoff famously performed the song atop the wall on New Year’s Eve 1989 wearing a piano-keyboard scarf and a leather jacket covered in motion lights. 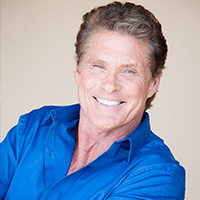 Since then, Hasselhoff has become one of the most recognizable faces on television and around the world. The success of Baywatch – particularly through its syndication deals – made him a multimillionaire. His wicked sense of humor has led to self-parodies in both movies (Sharknado flicks come to mind) and television (The Twins: Happily Ever After? ), which tickle fans with comic charm. Hasselhoff does have some regrets in life, however. “I find it a bit sad that there is no photo of me hanging on the walls in the Berlin Museum at Checkpoint Charlie,” he laments. A man of shameless self-promotion, the Hoff is a crowd-pleaser any way you slice him.